As the myth of Columbus “discovering” America falls from the pedestal of established history, we are given the opportunity to discover the real story of the New World and the visitors, from both East and West, who traveled there long before 1492. 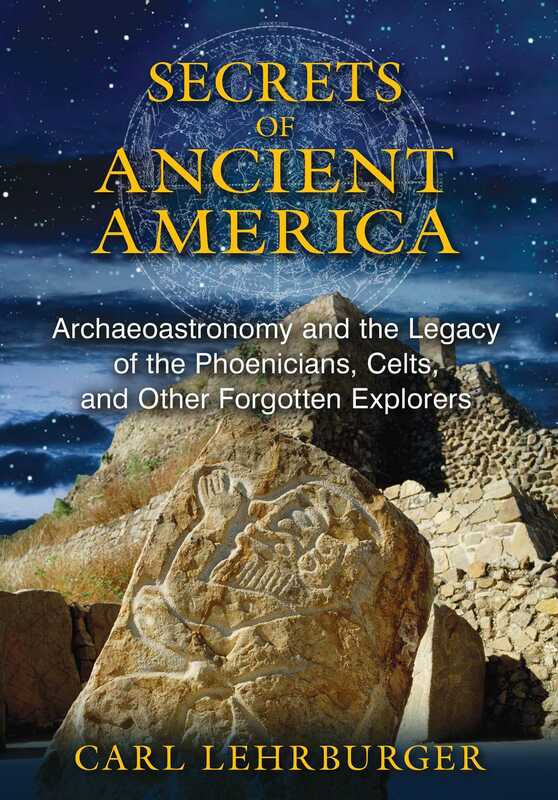 Sharing his more than 25 years of research and travel to sites throughout North America, Carl Lehrburger employs epigraphy, archaeology, and archaeoastronomy to reveal extensive evidence for pre-Columbian explorers in ancient America. He provides more than 300 photographs and drawings of sites, relics, and rock art, including Celtic and Norse runes in New England, Phoenician and Hebrew inscriptions in the Midwest, and ancient Shiva linga and Egyptian hieroglyphs in the West. He uncovers the real story of Columbus and his motives for coming to the Americas. He reinterprets many well-known archaeological and astronomical finds, such as the Ohio Serpent Mound, America’s Stonehenge in New Hampshire, and the Crespi Collection in Ecuador. He reveals Celtic, Hebrew, Roman, early Christian, Templar, Egyptian, Chinese, and Japanese influences in famous stones and ruins, reconstructing the record of what really happened on the American continents prior to Columbus. He also looks at Hindu influences in Mesoamerica and sacred sexuality encoded in archaeological sites. Expanding upon the work of well-known diffusionists such as Barry Fell and Gunnar Thompson, the author documents the travels and settlements of trans-Atlantic and trans-Pacific explorers, miners, and settlers who made it to the Americas and left their marks for us to discover. Interpreting their sacred symbols, he shows how their teachings, prayers, and cosmologies reveal the cosmic order and sacred landscape of the Americas. Local ranchers knew of the Sun Temple petroglyphs for many years before McGlone and Leonard arrived in 1984. It is located on a large ranch property that was situated on the high plains in eastern Colorado amid numerous five-story-tall, wind-sculpted “hoodoos” standing as sandstone sentries above a wide and shallow canyon. In addition to what was instantly recognized as an ancient Celtic alphabet, the modern explorers also found the engraved profile of a human head, featureless except for an upturned, button nose. Some forty feet away, an isolated, east-facing 14-inch (35.5 centimeter) diameter circle was found inscribed at the back of the amphitheater-like cove. It was then that McGlone and Leonard decided to name the place the Sun Temple. Most of the Sun Temple’s alphabetic grooves appear on the ceiling of a small, shallow cave approximately seven feet above the amphitheater floor, which is elevated well above the canyon floor. Protected somewhat by the ceiling’s overthrust is a panel tilted skyward on the lower lip of the wedge-like cave that has a bold but short inscription with several crisscross carvings. Nearby, about twenty feet higher up is a clue that nearly escaped the attention of McGlone and Leonard because splotchy black patina on the cliff face had camouflaged the grooves. What initially appeared to be a crudely etched tree trunk with branches on the cliff face was later understood to be the Sun Temple’s key Ogham inscription, underscoring an ancient scribe’s intent to memorialize a date- and site-specific sunrise alignment--that is, when to stand and where. The Tree Ogham, along with some grooves to the left, was written in Gaelic and was translated by McGlone and Leonard to mean THE RING ALONG WITH THE SHOULDER BY MEANS OF SUN AND HILL. Because of the site’s orientation, they supposed the Sun Temple might have an alignment at dawn on the Summer solstice but a number of sunrise vigils on June 21 yielded no obvious solar alignments and nothing involving the conspicuously inscribed ring. In this type of solar alignment, the sun is observed from a fixed target or at sunrise in the case of the circular pecked “RING” mentioned in the inscription. By looking at the “SUN and HILL” from the pecked RING on the cross-quarter day the specific event is seen. The word HILL clearly refers to the topology on the opposite side of the canyon, which is called a mesa from the Spanish meaning “table” in today’s terminology. However, one of this site’s most remarkable features is a massive rock overhang that juts out from the northern cliff wall. The overhang is parallel to and just above the horizon from the northern cliff wall, as viewed from the front of the approximate 1-foot diameter inscribed pecked circle or RING. On subsequent investigations, the researchers discovered that when one’s head is positioned in the pecked ring only on Lughnasa and Beltane, its Springtime cross-quarter mirror, the rising solar disc is perfectly framed within the gap formed by the shelf, the cliff face, and the distant hill. Thus, the jutting overhang must be the SHELF mentioned in the Tree Ogham inscription. Much of the Sun Temple’s association with Lughnasa evolved from the translation of the Gaelic Ogham. In addition to the Tree Ogham message there is another Ogham inscription on the roof of the wedge cave. A small circle dominates the ceiling within which appear the bold Ogham consonant, S-L, representing the word “SOL” (sun) and announcing in Gaelic (and other ancient scripts) that this place is a solar observatory. Strokes on the other side of the SOL inscription are thought to read, in Ogham: AT LUGHNASA THE SUMMER SUN RESTORES THE GATHERING FOR SPORTS. Close by the SOL inscription is another inscription translated by McGlone and Leonard as “SEASON FOR REAPING,” which coincides with the harvest festival of Lughnasa. The inscription includes a large pointed arrow or triangle aligned toward the rising sun in August. The triangular glyph could represent a cornucopia opening that is filled by the rays of the sun. Adding to the astronomical references, Phil Leonard has translated the bold Gaelic Ogham on the lower lip of the cave to read NOBLE TWINS, an Old World synonym for the Gemini constellation. Rollin Gillespie also was involved in unraveling the mystery of the Sun Temple. A mathematician and rocket engineer during the heady days of NASA’s Apollo missions, Rollin is credited with developing the navigational calculus that plotted the trajectories needed to reliably transport men to the moon and safely return them to Earth. Rollin had visited many of the Purgatoire River sites with Ted, Bill and others and at the Sun Temple, he postulated that the pattern of the marks resembled the Gemini constellation, with the slightly elongated two lead stars representing Castor and Pollux. The age of the Sun Temple has been unclear. However, two dating methods have been utilized. Professor Ron Dorn of Arizona State University used an experimental Cation ratio technique involving chemical analyses of the patina embedded in the grooves of the Noble Twins and Tree Ogham inscription that resulted in a dating of 900-1000 BCE, +/- 250 years. The second dating method involved astronomy as suggested by Rollin Gillespie. He showed that the marks in the inscription that are about one inch long represent Castor and Pollux in the Gemini constellation, whereas the three-inch plus marks are most likely planets. Gillespie, helped by Phil Leonard and associates at Evans & Sutherland in Salt Lake City, the leading manufacturer of digital planetariums in the world, identified an extremely rare triple planetary alignment in Gemini that occurred in the pre-dawn skies of August 471 CE. This alignment involved Venus, Jupiter, and Saturn and would have been seen from the site. Since it coincided with the season of Lughnasa it would undoubtedly have been worthy of memorializing in rock by posterity-conscious traveling Celts. Carl Lehrburger has studied archaeological and sacred sites in North America, with a focus on ancient Old World peoples in America before Columbus, for more than 25 years. He has published articles in Ancient American magazine. An avid traveler and explorer, he lives in Colorado.